Pakistan Prime Minister Imran Khan said that if the next Indian government were led by the Congress party, it might be too scared to seek a settlement with Pakistan over Kashmir issue. Just a day ahead of India's General Elections, Pakistan Prime Minister Imran Khan said he thinks there may be a better chance of peace talks with India if Prime Minister Narendra Modi's wins the general election and comes back to power. Imran Khan's statement came days after Pakistan minister Shah Mahmood Qureshi said that the nuclear-armed neighbour has reliable intelligence about India planning a new attack on Pakistan. "As per our information, India can attack Pakistan between April 16 and 20," Qureshi told the media. While giving an interview to a small group of foreign journalists, the Pakistan Prime Minister said that if the next Indian government were led by the opposition Congress party, it might be too scared to seek a settlement with Pakistan over Kashmir, fearing a backlash from the right. "Perhaps if the BJP - a right-wing party - wins, some kind of settlement in Kashmir could be reached," Imran Khan said. The cricketer-turned-politician also said that he never thought of seeing what is happening in India right now. "Muslim-ness is being attacked," Khan said. Imran Khan said Indian Muslims he knew who many years ago had been happy about their situation in India were now very worried by extreme Hindu nationalism. He said Modi, like Israeli Prime Minister Benjamin Netanyahu, was electioneering based on "fear and nationalist feeling". The BJP's pledge this week to propose stripping decades-old special rights from the people of Jammu and Kashmir, which prevent outsiders from buying property in the state, was a major concern, though it could also be electioneering, Imran Khan said. Imran Khan did appear to offer India an olive branch, saying that Islamabad was determined to dismantle all Pakistan-based militias in the country and that the government had full support from Pakistan's powerful army for the programme. Those to be dismantled include groups involved in Kashmir, reports Reuters. Nuclear-armed neighbours Pakistan and India both claim Kashmir in full but rule in part. Imran Khan said Kashmir was a political struggle and there was no military solution, adding that Kashmiris suffered if armed militants from Pakistan came across the border, leading to Indian army crackdowns. Since 1947, India and Pakistan have fought three wars, two over Kashmir. The relations between the two neighbours deteriorated after a suicide bombing killed 40 Indian paramilitary troopers in Kashmir on February 14. Though Islamabad denied responsibility for the Feb 14 attack, Pakistan-based militant group Jaish-e-Mohammed claimed responsibility for the attack. This deadly attack prompted India to carry out a cross border air strike against what it said was a militant training camp in Pakistan. The town of Balakot was struck by the Indian Air Force (IAF) at 3:30 am on the morning of February 26 in the Khyber-Pakhtunkhwa province of Pakistan, twelve days after the Pulwama terror attack on 14 February. The IAF fighter jets dropped around 1,000kg bombs, which reportedly killed at least 350 Jaish-e-Mohammed (JeM) terrorists. However, Pakistan has denied time and again India's claims of having inflicted casualties at the JeM terror camps. 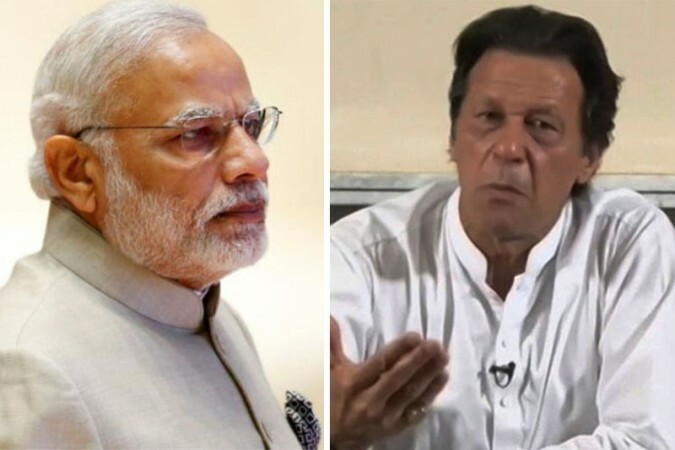 Meanwhile, Imran Khan said there was still the possibility if the polls turn against Modi in the next few weeks that India could take some further military action against Pakistan. The 2019 Lok Sabha polls will be held in seven phases from April 11 to May 19, with results due on 23 May.